WILL SHAKESPEARE GET A BIRTHDAY TEXT MESSAGE FROM YOUR STUDENTS AND YOU? We bring you big doings and a special invitation this month… Keep reading for all the exciting, once-in-a-lifetime details as we celebrate 400 years of Shakespeare! On April 23rd, the day the world commemorates Shakespeare’s birth (and death), the Folger will host an international live streaming event—called The Wonder of Will LIVE—from our historic Paster Reading Room. Broadcast live via C-SPAN2 and streamed at Folger.edu, all kinds of famous people—including United States Supreme Court Justice Stephen Breyer; actor and President Obama’s appointed Associate Director of the White House Office of Public Engagement, Kal Penn; and the hilarious Reduced Shakespeare Company—will share their personal connections to Shakespeare through stories and performances. We’ll share these greetings with the world via blog and social media posts. AND… we’ll highlight some of your birthday greetings during the live show, so be sure to watch. Tune in. 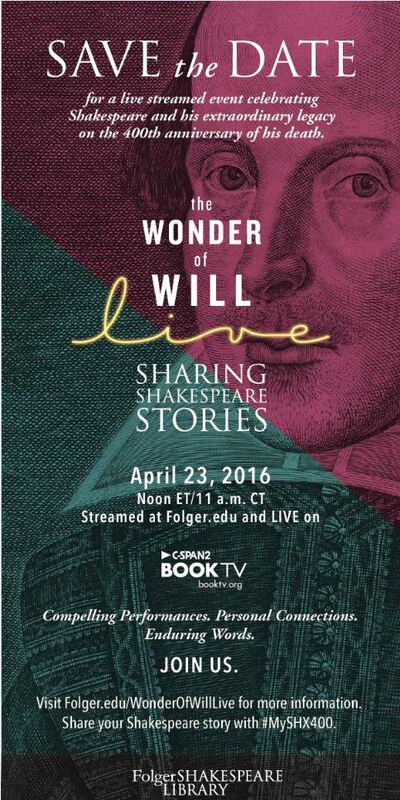 From 12:00 noon to 1:30 PM ET on April 23, 2016, watch the live streaming program at Folger.edu or on C-SPAN2 Book TV. Yes, it’s a Saturday. And yes, it’s a Saturday in the spring. But it’s historic! Was not extra credit invented for this purpose? We hope you’ll join this unique opportunity and add your voices to this wonderful, international celebration of Shakespeare and the power of storytelling. Questions? Tweet us at @FolgerED. James Earl Jones was the greatest Othello ever. I have to ask whether there will be an equivalent live tribute to Shakespeare on the 23rd of April…you see, my enthusiasm made me announce at work, I work at the public library of Larissa, Greece, that we would join in your live streaming, together with many kids, teens and their parents, only to notice the ET time reference subsequently…we’re 7 hours early…could you recommend an alternative? Thank you so much!